This entry was posted in Community, Events and tagged School of Kinesiology on April 1, 2014 by Wire Eagle. AUBURN UNIVERSITY – The Auburn University School of Kinesiology’s first Move and Groove Family Fit Day will offer games, wheelchair tennis and basketball, USA Team Handball demonstrations, group sport and exercise activities and sport technique analyses for optimization and injury prevention among other activities. 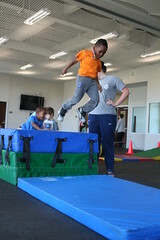 The free, public event, which features more than 20 activities focused on children’s health and fitness, will be held Saturday, April 5, from 9 a.m. to noon in and around the kinesiology research facility on the Auburn University campus at 301 Wire Road next to the campus tennis courts. This entry was posted in Faculty and tagged College of Education, School of Kinesiology on February 20, 2014 by Wire Eagle. AUBURN UNIVERSITY – The American College of Sports Medicine has appointed Auburn University’s Bruce Gladden as editor-in-chief of its flagship journal, “Medicine & Science in Sports & Exercise. Gladden is a Humana-Germany-Sherman Distinguished Professor in Auburn’s School of Kinesiology in the College of Education. A Fellow of the American College of Sports Medicine since 1980, he has an international reputation in the field of exercise physiology with more than 100 cited scientific publications and more than 3,500 citations to those publications.